First introduced at last year’s Paris Air Show, the SureFly octocopter last week earned its experimental FAA certificate as the company works toward full FAA certification by the end of next year. No word yet on a new date for that first flight. While early SureFly models will be pilot operated, the company hopes future versions will operate autonomously. The SureFly will carry two people as far as 70 nm to altitudes of 4,000 feet. The aircraft uses a gasoline-fired piston engine to drive the dual generators needed to power its eight electric motors, each driving a single propeller. The machine incorporates a dual Lithium battery pack as an engine-failure back-up and comes standard with a ballistic parachute system. Retail price of the potential air-taxi machine is just $200,000. 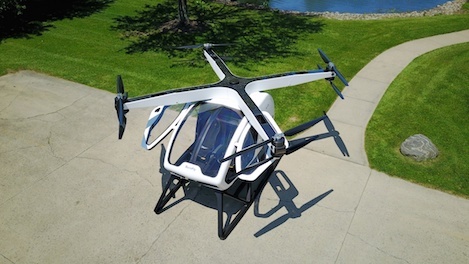 Workhorse, traditionally a creator of electric mobility solutions for commercial transportation, recently created a new public aviation division called SureFly Inc. that includes the company's aerial technology, like the SureFly octocopter and the HorseFly drone. The new company will focus on its new flying machines so Workhorse can focus on its core business.